Further to our discussions over treacle cured bacon a while back, and various experiments, I have just broken open what I think is the ideal all round answer for a simple, easy black cure. I used an offcut that would have otherwise gone to make back bacon, so fat content is lower than a belly cut, I also trimmed the rind off to see how this helped penetration. Treacle and sugar were warmed just enough to allow all ingredients to be blended together effectively, then the whole lot is rubbed onto the meat (which was thoroughly dried with a cloth to ensure good adhesion). This was then vac-packed and chilled for 12 days (turning and rubbing evey other day). Rinsed off and hung for another two days in the chiller. Result: Fantastic bacon doesnt get much better - lovely flavour, good penetration of the treacle, but not overpowering. The edges all caremalised with a sticky black syrup. I will be very surprised if this Kg survives the next 24 hours!!! Can anyone advise on where to buy raw cane sugar in small (ish) quantities? I think we have bought our Panela through both Suma and Essential. I've just spent christmas in a cottage on the Chatsworth estate in Derbyshire and whilst I was there I tried some of the Chatsworth Cure bacon which is a black cure. It was awsome and I thought I'd have a go at reproducing it, this recipe should prove to be a useful starting point. Thanks for posting it. The Chatsworth bacon was streaky but the meat was exceptionally lean, it was also smoked and really rather dry. It was very unusual, which is why I think I liked it so much. 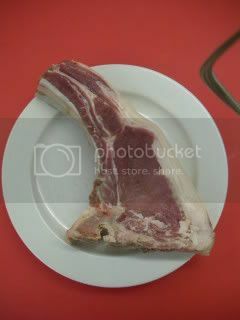 1-here in the states, pork loin is about 100% lean [eye of loin]. is that the kind of loin you are talking about?? somthing with more fat?? 2-is the salt regular canning salt, or, is it kosher salt? i'm excited to try this one. will probably split the recipe smoking one half and just drying the other half. i guess for the smoked half i'll use cure #2. boy, does it sound nice. because everything i do is with my own pigs, I can trim cuts however I want. When I am doing loins, whether its for steaks, medallions, back bacon or Lonzino I take off the rind and normally trim the hard back fat to within 6-10mm of the eye meat, depending on the desired end product. I tend to then cut the whole loins into manageable 2Kg lumps for dry curing bacon. Alot of our belly joints go for Pancetta of one kind or another and this is either sold or, I have to admit, is what I tend to use in place of streaky bacon most of the time, it just hangs waiting to be used. This meaans that most of the bacon i make is back bacon. salt wise I tend to use coarse sea salt for most curing. The loin he refers to is as you describe - ours is cut a bit longer but is otherwise the same. Kosher salt isn't common in the UK, but that's what I'd use for yours. Our bacon is not 'pre-cooked' and, if smoked, is cold smoked. I'd use cure #1, not cure #2, for this. On the right is an orange cure breakfast bacon I have been working on, contrast the colour with the black treacle cure offcut on the left. What breed are they? They've got a good fat layer. These were from some Old spots crossed with our Tamworth boar. They have a great fat covering, and an especially clean hard back layer, alot of which we cut up for salami making. We feed no concentrates and the herd has no chemicals, antibiotics or other 'additive' treatments, so the fat is a store house for minewrals and Vits that they get from their fresh food diet high in Omega 3 and other healthy fatty acids. We have Saddlebacks and Old spots both crossed with Tamworth boar for traits such as a slightly leaner tendency (rather than running to too much fat) and an ability to thrive on wild food in the woods, this is used for most 'recipe' pork. We also run leaner Pietrains for fresh cuts and pork boxes. Oh, how I wish I lived nearer. I must get down on holiday and visit sometime.